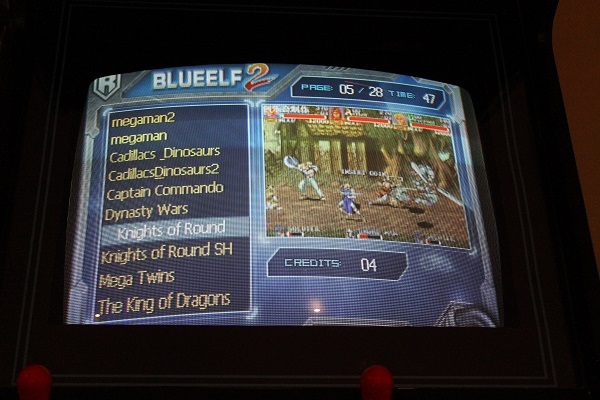 I have recently bought a Blue Elf 2 309 in 1 multi game arcade board to supplement the array of games I could already play on my arcade cabinet with some non-Neo Geo gems such as Knights of the Round, Rastan Saga, Final Fight, Cadillacs and Dinosaurs, etc. I was pretty bummed to discover that while the cartridge booted and displayed the game selection screen, I couldn't move the cursor, or select any game. If I inserted a coin, it would register, but not the controls. Neither the joystick nor the push buttons did anything. 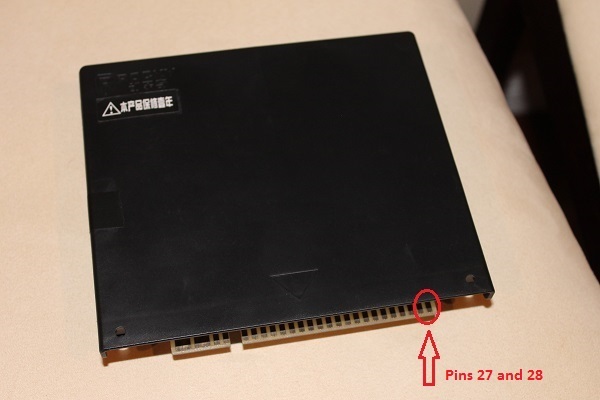 I've read a few forum posts on similar issues, and the problem was that pin 28 of the JAMMA connector was not grounded. 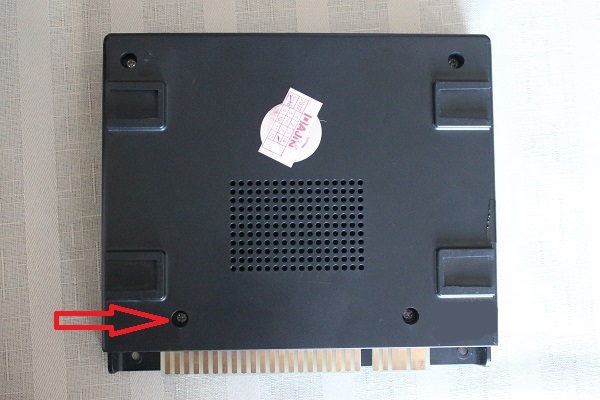 My cabinet is a standard JAMMA, wired to a single slot Neo Geo MVS motherboard, and I guess that with that setup, pin 28 could just be left floating, since my JAMMA harness doesn't even have a metallic pin at position 28 to make contact to the PCB's pin. It may be because what I have is standard JAMMA, and the Blue Elf 2 requires JAMMA+ (or extended JAMMA). Since pin 27 must be grounded, all I did to get the controls working is connect pins 27 and 28 together. 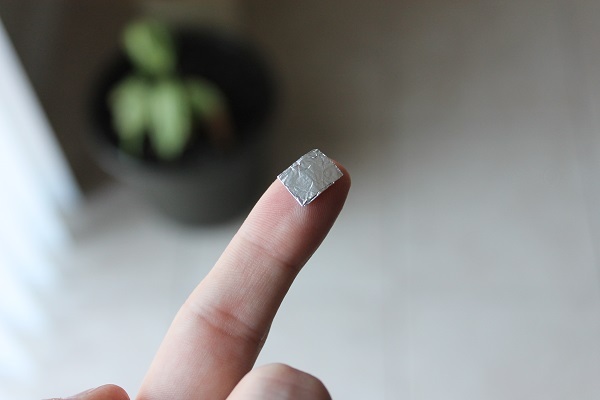 Cut out a small strip of aluminum, between 2 and 3 cm long and about 1 cm wide. 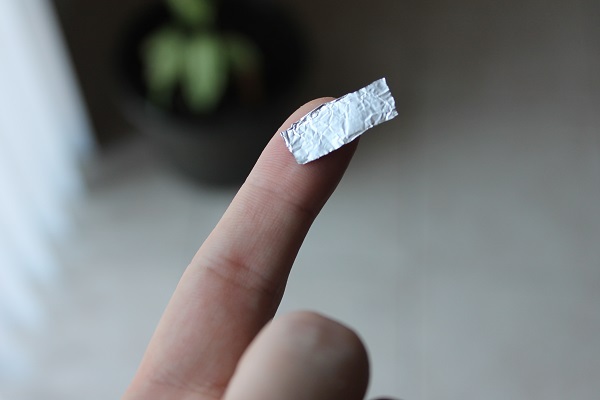 Fold the strip in two to give it some thickness. You may notice that one side is shinier, whereaas the other is duller. Keep the shinier side outward, since it's going to be the one making contact with the two pins. Loosen the screw shown below. 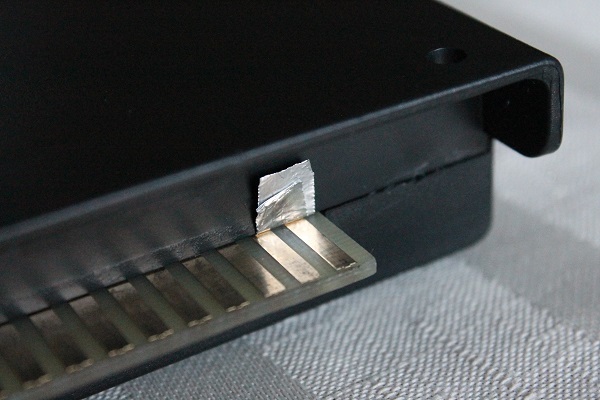 Pry open the corner of the cartridge, and insert the folded aluminum strip about halfway in. Be careful not to place it too closely to the third pin (pin 26), so you don't get any unexpected connections. 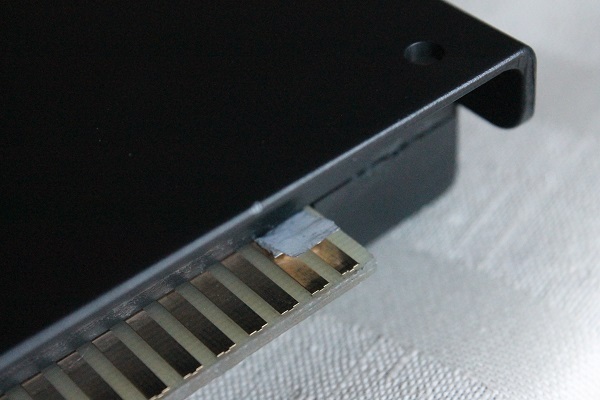 Tighten back the screw, and fold upward the part of the strip that's outside, so that it doesn't get crumpled when the cartridge is inserted in the JAMMA harness. That's it; connect the cartridge, start it up, insert a coin, and start playing!